"As you can imagine, there was an awful lot to figure out in a very short space of time," recalls McNab. "There was a number of operational requirements that absolutely had to be met, as we simply couldn't have a facility that, technically, didn't deliver what operational staff need of it." He goes on to explain: "For example, here at ITV we produce a lot of quick turnaround programming, including factual entertainment, archive programming and current affairs, which are edited and played out for transmission on the same day. That meant we were building both an edit facility and transmission (TX) infrastructure. We also had to take into consideration the fact the workflows were going tapeless, and think what operational impact that would have, as well as how to allow producers, directors and editors to work together more collaboratively. "So we knew what had to be built and then it was a case of how to ensure the end result was flexible enough to accommodate our needs for the next ten to fifteen years, without hampering our ability to do the day job from day one," reveals McNab. "In order to achieve the scale we desired, we opted for a video and audio routing solution from Blackmagic Design that was capable of handling both SDI and optical fiber. The Universal Videohub 288 offered a cost effective solution as well as both scale and flexibility in terms of the I/O cards it can take. The ability to route via any combination of SDI and fiber cards, without having to do any conversion on the end of that is perhaps the biggest selling point. It made it very easy for us to say those edit suites are further away from the machine room while these aren't, so we only fibered up what was needed. Blackmagic's router really doesn't care what you present it with, it just sorts it out, no fuss." "Now, we still have a need for moving some analog content around and so we also installed an analog routing solution, and four Teranex 2D boxes from Blackmagic, which sit between the Universal Videohub and the analog router. These handling conversions from SDI to analog or the other way around, and some format conversion too." "While we don't do a huge amount of standards conversion, this is a very useful piece of kit to have at your disposal as we do receive and have to send out NTSC material; there was even a requirement recently to ingest some VHS, and sometimes the material is more important than the quality. In this instance the only source available was VHS. Having the Teranex boxes in place has meant that we could handle jobs that we would previously have required a number of different pieces of equipment. "What's really nice about the Videohub is its size and the fact that we didn't have to spend a lot of rack space on it. I also like the choice of software and hardware control. We invested in some of Blackmagic's Videohub Master Control and Videohub Smart Control panels, some of which have been installed in the machine room, others have been fitted in specific suites. But the ability to not be tied into using a hardware panel, and needing the infrastructure for that router to be thought out before you decided where you wanted to route from was great and really helps with our future flexibility." Video and audio infrastructure hasn't been piped to every room in the building, but there are tie lines across two floors. The fourth floor is 3sixtymedia's main facility space, so it is heavily flooded with connectivity. Every room has SDI and, or, fiber points underneath the floors. There are also tie lines up on to the fifth floor where ITV production teams can view and ingest away from the main facility. It means that if they do have a need to put edit suite upstairs ITV can, or if a room needs to be converted for another purpose in the future, it doesn't have to be re-designed, instead they just have to stick a different bit of kit in and pipe through the relevant systems. "That is the beauty of having core infrastructure racked up in a massive machine room. Staff simply punch up what systems they need via the KVM system and then tell the video and audio systems what they need, and where it needs to go, all at the touch of a button." "In terms of the number of hours of television we output, it is broadly similar, however the amount of time it takes to generate that programming is less than it was. The workload for producing content can be shared far more efficiently, some of which is down to the new infrastructure and some of which is the result of new and improved procedures. There are far fewer issues here, and certainly less head scratching as to how we are going to make things work. The phased migration of systems and personnel from Quay Street was completed in early 2014. All of that happened without us ever needing to reschedule work or cancel a TX." "Ultimately, what the move has allowed us to do was to completely rethink the way we do things while also giving us a huge amount of flexibility operationally. 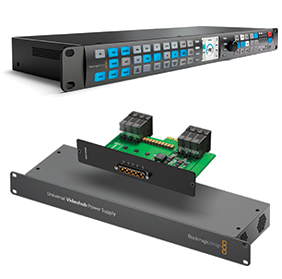 Not only that, but we are now in a better place to adapt to the future, and that is all down to the modular nature of the system we've built around Blackmagic's Universal Videohub 288, as we can remove, and upgrade individual components, without needing to make wholesale changes." Taig worked alongside Root6, who were heavily involved at the outset of this project in both designing and installing the new video and audio infrastructure at ITV's MediaCityUK facility, McNab concludes, "The driving force behind this project was always the operational needs of staff and clients alike, and through that came a design and specification that Root6 worked to. They came up with some very innovative solutions to many of the items on my wish list. The wiring job on the back of the Universal Videohub 288 is a true masterpiece!"